BYZANTINE EMPIRE. 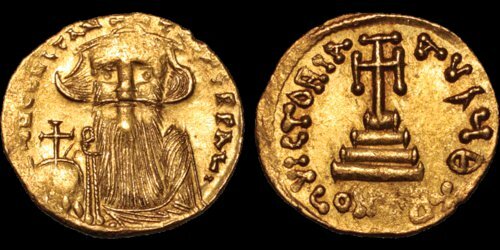 Constans II. 641-668. AV solidus. 4.5 gm. 19 mm. 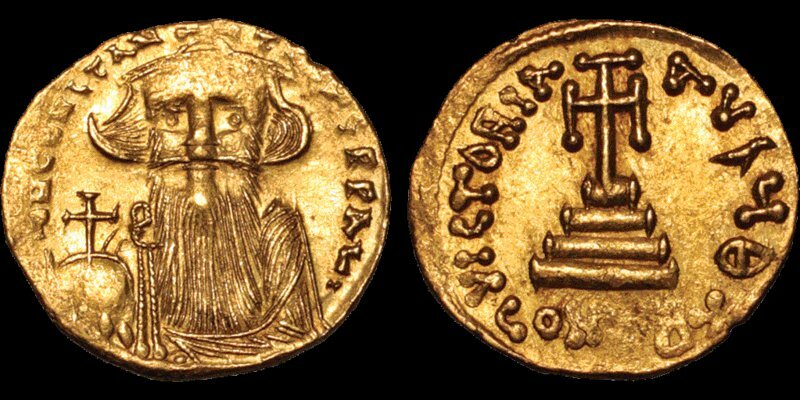 Constantinople mint, 9th officina. Struck 651/2-654. His crowned bust facing, wearing chlamys and holding globus cruciger / Cross potent set upon three steps; Θ//CONOB. SB 956. Near Extremely Fine; lustrous; area of weak strike on forehead, otherwise crisp and attractive. Ex Early American History Auctions (5 June 2004) lot 1096.